11% of internet users (representing 9% of all adults) say that they have personally used an online dating site such as Match.com, eHarmony, or OK Cupid. 7% of cell phone apps users (representing 3% of all adults) say that they have used a dating app on their cell phone. Taken together, 11% of all American adults have done one or both of these activities and are classified as “online daters.” In terms of demographics, online dating is most common among Americans in their mid-20’s through mid-40’s. Some 22% of 25-34 year olds and 17% of 35-44 year olds are online daters. Online dating is also relatively popular among the college-educated, as well as among urban and suburban residents. And 38% of Americans who are single and actively looking for a partner have used online dating at one point or another. Compared with eight years ago, online daters in 2013 are more likely to actually go out on dates with the people they meet on these sites. Some 66% of online daters have gone on a date with someone they met through an online dating site or app, up from 43% of online daters who had done so when we first asked this question in 2005. Moving beyond dates, one quarter of online daters (23%) say that they themselves have entered into a marriage or long-term relationship with someone they met through a dating site or app. That is statistically similar to the 17% of online daters who said that this had happened to them when we first asked this question in 2005. 59% of all internet users agree with the statement that “online dating is a good way to meet people,” a 15-point increase from the 44% who said so in 2005. 53% of internet users agree with the statement that “online dating allows people to find a better match for themselves because they can get to know a lot more people,” a 6-point increase from the 47% who said so in 2005. 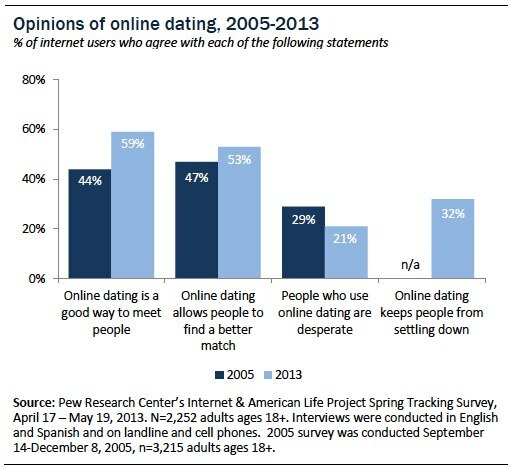 21% of internet users agree with the statement that “people who use online dating sites are desperate,” an 8-point decline from the 29% who said so in 2005. Additionally, 32% of internet users agree with the statement that “online dating keeps people from settling down because they always have options for people to date.” This is the first time we have asked this question. Familiarity with online dating through usage by friends or family members has increased dramatically since our last survey of online dating in 2005. 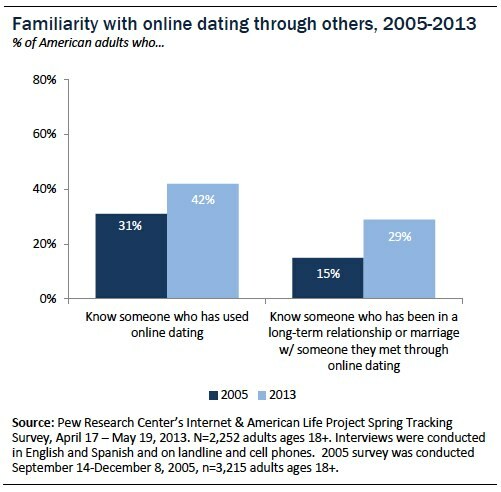 Some 42% of Americans know someone who has used online dating, up from 31% in 2005. And 29% of Americans now know someone who met a spouse or other long-term partner through online dating, up from just 15% in 2005. 57% of all college graduates know someone who uses online dating, and 41% know someone who has met a spouse or other long-term partner through online dating. 57% of Americans with an annual household income of $75,000 or more know someone who uses online dating, and 40% know someone who met a spouse or partner this way. Even as online daters have largely positive opinions of the process, many have had negative experiences using online dating. Half (54%) of online daters have felt that someone else seriously misrepresented themselves in their profile. And more seriously, 28% of online daters have been contacted by someone through an online dating site or app in a way that made them feel harassed or uncomfortable. Women are much more likely than men to have experienced uncomfortable contact via online dating sites or apps: some 42% of female online daters have experienced this type of contact at one point or another, compared with 17% of men. 40% of online daters have used dating sites designed for people with shared interests or backgrounds, and one in three have paid to use a dating site or app. One in five online daters have asked someone to help them review their profile. 40% of online daters have used a site or app for people with shared interests or backgrounds. 33% of online daters have paid to use an online dating site or app. Organized outings are much less common, as just 4% of online daters have attended a group outing or other physical event organized by an online dating site. Additionally, 22% of online daters have asked someone to help them create or review their profile. Women are around twice as likely as men to ask for assistance creating or perfecting their profile—30% of female online daters have done this, compared with 16% of men. 5% of Americans who are currently married or in a long-term partnership met their partner somewhere online. Among those who have been together for ten years or less, 11% met online. Even today, the vast majority of Americans who are in a marriage, partnership, or other serious relationship say that they met their partner through offline—rather than online—means. At the same time, the proportion of Americans who say that they met their current partner online has doubled in the last eight years. Some 6% of internet users who are in a marriage, partnership, or other committed relationship met their partner online—that is up from 3% of internet users who said this in 2005. On an “all-adults” basis, that means that 5% of all committed relationships in America today began online. This question was asked of everyone in a marriage or other long-term partnership, including many whose relationships were initiated well before meeting online was an option. Looking only at those committed relationships that started within the last ten years, 11% say that their spouse or partner is someone they met online. Younger adults are also more likely than older ones to say that their relationship began online. Some 8% of 18-29 year olds in a marriage or committed relationship met their partner online, compared with 7% of 30-49 year olds, 3% of 50-64 year olds, and just 1% of those 65 and older. In addition, people who have used online dating are significantly more likely to say that their relationship began online than are those who have never used online dating. Fully 34% of Americans who are in a committed relationship and have used online dating sites or dating apps in the past say that they met their spouse or partner online, compared with 3% for those who have not used online dating sites. Young adults are especially likely to flirt online—47% of internet users ages 18-24 have done this before, as have 40% of those ages 25-34. And while younger adults are also more likely than their elders to look up past flames online, this behavior is still relatively common among older cohorts. Some 21% of internet users ages 45-54, and 15% of those ages 55-64, have gone online to look up someone they used to date. Additionally, 29% of internet users with recent dating experience have gone online to search for information about someone they were currently dating or about to meet for a first date. That is more than double the 13% of such internet users who did so when we last asked about this behavior in 2005. One third (31%) of all SNS users have gone on these sites to check up on someone they used to date or be in a relationship with. 17% have posted pictures or other details from a date on a social networking site. Younger adults are especially likely to live out their relationships through social networking sites. 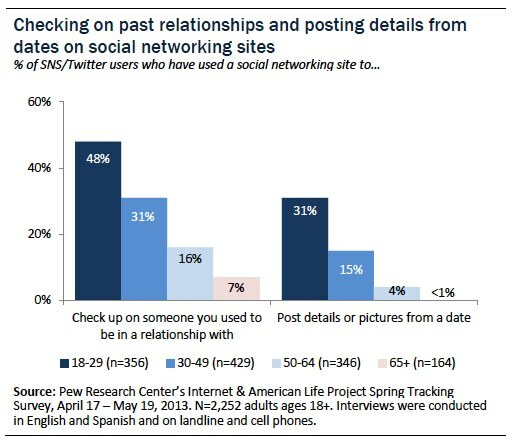 Some 48% of SNS users ages 18-29 have used these sites to check up on someone they dated in the past, and 31% have posted details or pictures from a date on a social networking site. These sites are also being used as a source of background research on potential romantic partners. Nearly one third (30%) of SNS users with recent dating experience1 have used a social networking site to get more information about someone they were interested in dating. And 12% of SNS users with recent dating experience have friended or followed someone on a social networking site specifically because one of their friends suggested they might want to date that person. Beyond using these sites as a tool for researching potential partners, some 15% of SNS users with recent dating experience have asked someone out on a date using a social networking site. As more and more Americans use social networking sites, these spaces can become the site of potential tension or awkwardness around relationships and dating. 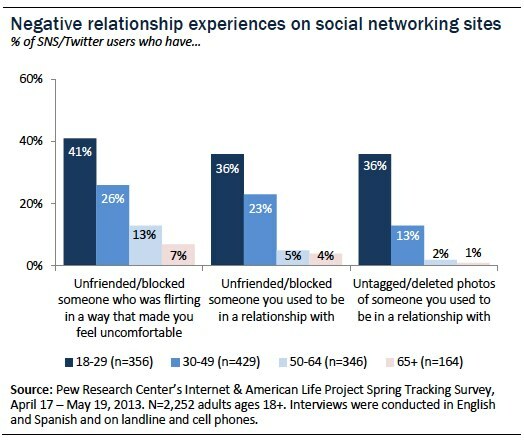 Some 27% of all social networking site users have unfriended or blocked someone who was flirting in a way that made them feel uncomfortable, and 22% have unfriended or blocked someone that they were once in a relationship with. These sites can also serve as a lingering reminder of relationships that have ended—17% of social networking site users have untagged or deleted photos on these sites of themselves and someone they used to be in a relationship with. Not surprisingly, young adults—who have near-universal rates of social networking site use and have spent the bulk of their dating lives in the social media era—are significantly more likely than older social media users to have experienced all three of these situations in the past. And women are more likely than men to have blocked or unfriended someone who was flirting in a way that made them uncomfortable. This report is based on the findings of a survey on Americans’ use of the Internet. The results in this report are based on data from telephone interviews conducted by Princeton Survey Research Associates International from April 17 to May 19, 2013, among a sample of 2,252 adults, age 18 and older. Telephone interviews were conducted in English and Spanish by landline (1,125) and cell phone (1,127, including 571 without a landline phone). For results based on the total sample, one can say with 95% confidence that the error attributable to sampling is plus or minus 2.3 percentage points. For results based on Internet users (n=1,895), the margin of sampling error is plus or minus 2.5 percentage points. Interactive: Online Dating: What’s Your View?